Linda Lou (Jett) Johnson was born in Shattuck, Oklahoma, April 3, 1952, to Calvin and Irma Jett. She entered into eternal rest on January 30, 2019, at the family home near Boise City, Oklahoma. 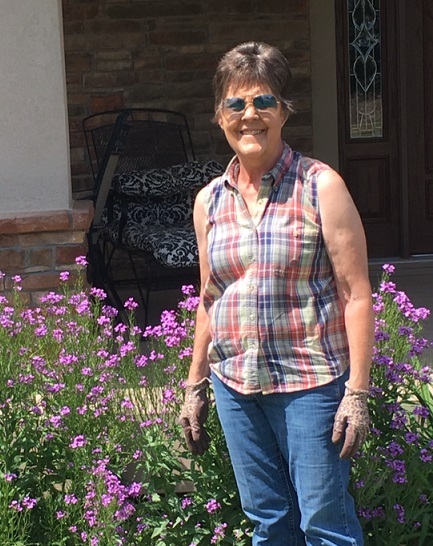 As a young girl, Linda always loved the outdoors and enjoyed being involved in the chores and the work on the family farm and ranch near Slapout, Oklahoma. Linda attended a small country school called Victory School for the first few years of grade school; then transferred to Laverne, Oklahoma, where she graduated in 1970. Linda was involved in 4-H from the very beginning and began showing cattle at an early age in the County Stock Show as well as in Oklahoma City, Oklahoma. Linda had a great passion for cooking and graduated from Oklahoma State University with a major in Home Economics in May of 1974. Upon graduation, she wasn’t sure when or where she would be going to pursue a career. Shortly after graduation, Boise City High School called her for a home economics position and hired her over the phone. Little did she know, she would be spending the next 44 plus years in Boise City, Oklahoma, after catching the eye of Steve Johnson who was a senior attending Panhandle State University. Following a short engagement, Steve and Linda were married May 18, 1975, near Slapout, Oklahoma. To this union three children were born: Tamra Dawn Johnson, Dana Lynn Johnson, and Nathan Wayne Johnson. When their family was started, Linda quit teaching to spend time with their three children and their projects. Linda was always so proud of them and all of their accomplishments. Tamra never ceased to make her mother proud throughout school academics and athletics, college, and life. She was married to Nathan Crabtree, blessing her with Aiden, Baylor, and Carter. Nathan’s accomplishments in school also represented the family well. Sharing his mother’s attributes, Nathan currently serves on the NRCS Board and FARM CREDIT Board for the state of Oklahoma,and gave her the blessings of Presley and Tripp. Linda’s love for teaching never stopped. After the children were grown, she began teaching Alternative Education at Boise City High School. She taught for nine years in this program which is designed to assure that every student gets the opportunity to graduate. Until recently, she still had students come up to say “Thank You” for encourageing them to attain a “High School Diploma”. Steve and Linda joined St. Paul’s United Methodist Church shortly after they were married. Through the years, Linda stayed very active in church and served on various committees and boards. Most recently, she was proud of being on the Board of Little Harvester Pre-School. She really enjoyed co-chairing the annual Harvest Dinner with Colleen Allen and loved helping with the student “Breaking Bread” program at the church. Friendship was a major priority with Linda. She actively belonged to Eta Alpha Sorority; this was an avenue in which not only good was done, but love and sisterhood was shared. Linda enjoyed family and friends and big dinners; consequently, she was always asked to bring the pies, those mainly being pumpkin and pecan. Linda captured many relaxing trips to Red River, New Mexico, to be with family and friends at all times throughout the year. Her cabin in the woods was her serenity. For years, she enjoyed attending the National Finals Rodeo in Oklahoma City and in Las Vegas. Linda also revolved around all of the many other trips she took spending time with Steve. Last but not least… many memories, fajitas, and much laugher was shared with Carla and Rick on Steve and Linda’s weekly travels to Cactus Jack’s! One of Linda’s favorite hobbies was growing plants and flowers. She loved having a big garden and canning the produce for the remaining year. Another hobby Linda enjoyed was collecting Coca-Cola memorabilia and was so proud of the room Steve built her to home her prized collections. The hobby all of the family liked the best was when she and Lotha (her mother-in-law) made Berox. Much fun and many pounds were gained when those two got together! Linda was the “Driving Force” behind the family’s farming operation. She was always eager to help wherever she was needed whether it meant spending many hours on a tractor or taking big meals to the field for harvest crews. Linda was proud to say that she had a Commercial Driver’s License and a “Concealed Weapon Carry Permit”. Most of all, Linda really enjoyed spending time with her five grandchildren who were her pride and joy. Watching them grow and attending their activities kept her bustling and on the go….. never tiring, always excited, always supportive, and always proud. Carter, Baylor, Aiden, Presley, and Tripp were such enormous inspirations in Grammy’s life! Linda will forever be missed by her family, relatives, and friends. Survivors include her husband, Steve Johnson, son Nathan Johnson, son-in-law Nathan Crabtree, five grandchildren, Tripp and Presley Johnson, Aiden, Baylor and Carter Crabtree; brother,Alan Jett and wife Alyson of Slapout, OK, sister, Sue Hoover of Booker, TX; sister-in-law, Carla Honey and husband Rick of Hardesty, OK. Linda is also survived by her aunt Alice Johnson of Guymon, OK; cousins, Leslie and Steve Kraich and Leesa Hogan, and many nieces, nephews, great nieces, great nephews, and cousins…. Each that will forever hold a special place in her heart. Friends may go by and sign the book at the Boise City Funeral Home on Friday, February 1, 10:00 AM - 7:00 PM. Funeral services will be Saturday morning, February 2nd, 10:30 AM at St. Paul's United Methodist Church. Interment will follow in Boise City Cemetery. Donations may be given in Linda's memory to St. Paul's Methodist Church Breaking Bread Youth Fund, the St. Paul's Methodist Church Kitchen Fund, or a charity of choice, and may be left at the church or mailed to Henson-Novak Funeral Directors, P.O. Box 1306, Guymon, OK 73942. Friends may sign the guest book or leave an online condolence at www.hensonnovak.com.